Visitors flock to the Lake District today for the peace and serenity of England’s finest National Park, the feeling that nothing has ever disturbed the calm and stillness of this majestic mountain landscape. How wrong can you be! In the middle ages, that era of kings and knights, cathedrals and crusades, Lakeland and the surrounding area was a dangerous frontier zone, a war-torn province endlessly fought over by two intractable foes. England’s King Edward I’s invasions of Scotland, and the Scots’ ravages of northern England, brought death and destruction to the fells and farms of our lovely hill country. This age of destruction led to a remarkable series of defensive fortifications coming into being – the pele (or ‘peel’) towers which still dot the landscape today. They are a fascinating adornment to our countryside, some now ruinous, others transformed into palatial houses. 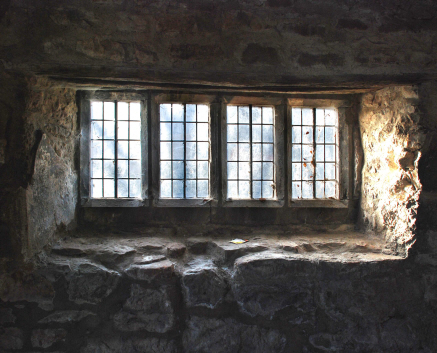 For those who would seek out pele towers, ancient Cumberland, Westmorland and Furness are their usual locations. For interest, history and beauty however, the traditional county of Westmorland is their real heartland. 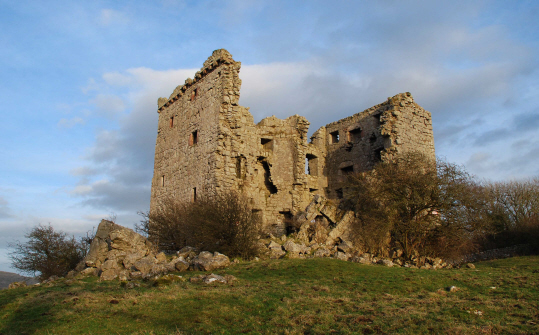 Westmorland’s pele towers are all different, but they tend to follow a similar pattern. They are normally square, like a castle keep, with walls of tremendous thickness. They have no outer curtain wall or palisade like regular castles – they themselves are the palisade or ‘pele’. They have windowless ground floors, with storage areas in a tunnel-vaulted chamber inside containing enough to withstand a siege; they have a first floor hall and kitchen; and they have accommodation on the top storey. 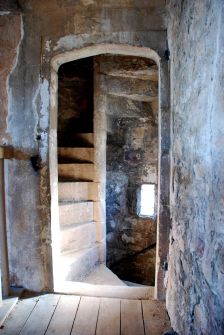 A spiral staircase connects the floors. 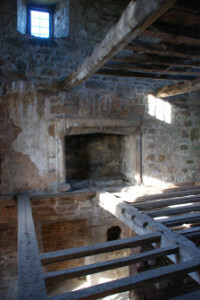 The roof is usually battlemented so that arrows and missiles could be launched at the invaders. A serious, concerted siege could probably capture a pele tower over a prolonged period, but they were designed to thwart invaders who were passing through and would soon leave your area to ravage somewhere else. As such, most are built in the lower-lying areas of Westmorland, the valleys that afforded access to the Scots, and the hills on the outskirts of the Lake District. Fewer are found in the safer areas of the really high mountain country. I first came became aware of the romantic splendour of ruined peles as a child, when my father took myself and my brother on an exploratory climb of Arnside Pele, that achingly lovely edifice that dominates a little valley between Arnside and Silverdale. Apart from the terror of the ascent – bits of the tower were on the verge of collapse even as we climbed up – I remember the beauty of the pele’s setting, with distant vistas of the sea and the soft sunlight falling on weathered stonework. I was also struck by the pele being situated in a farmer’s field, seemingly miles from other habitations, and I wondered why it should be just here rather than anywhere else. Much of Westmorland’s wonderful heritage of pele towers are now part of working farms. 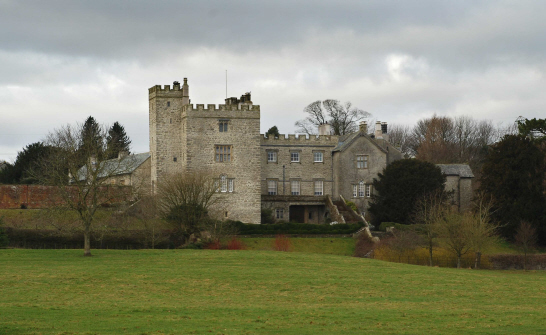 Clifton Hall near Eamont Bridge is a pele tower located adjacent to a complex of farm buildings while Burneside Hall near Kendal is perhaps the most enchanting of all peles which are sited within a farm. Here later wings have been added to the medieval pele, and the whole ensemble is now an ivy-covered vision, a picturesque ensemble with a lovely gatehouse and garden. Beetham Hall, sited perfectly so travellers on the A6 south of Milnthorpe can gaze on it, is half-pele tower, half fortified manor house, all now a working farm. History happened here: Fairfax captured it during the Civil War in 1644. It is yet another of Westmorland’s impressive inventory of farms based on historic pele towers. Of course, some pele towers are neither ruins nor are absorbed into farms. Some have become stately homes, the ancestral seats of Westmorland’s gentry. Levens Hall is the splendid home of the Bagot family and dates from Elizabethen times. 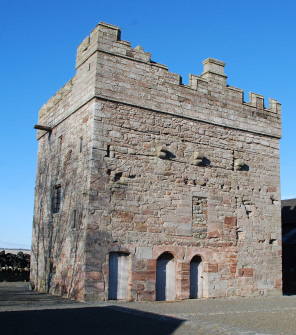 However it is built around a pele tower from the 13th century, a typical fortification against Scottish incursions. Nowadays visitors come to lovely Levens to admire the fabulous gardens, the world famous topiary and the beech hedges, or to see steam traction engines or sample the Morocco Ale brewed there. Others come to see the sumptuous Jacobean furniture and fine paintings. Few suspect the site is really a piece of medieval military architecture, an entrenchment against forces of violent invaders. The same is true of Sizergh Castle, just up the road from Levens. Here a Tudor mansion, complete with courtyard and rambling gardens, forms the family home of the Stricklands – they have lived here for more than 750 years! The National Trust maintains the gardens, including their national collection of hardy ferns as well as rock gardens and beautiful wild flower meadows. Visitors ambling past elegant lakes might occasionally wonder at the tall tower that seems to be the focus of all the buildings. It is a 14th century pele tower, a reminder of the days when England and Scotland were perpetual enemies and Westmorland was more associated with garrisons than gardens. One of the most curious of Westmorland’s pele towers lies in Kentmere, that glorious valley near Staveley in the southern reaches of the Lake District. Here Kentmere Hall is a lovely pele tower with house attached – so gorgeous that Turner came to sketch it. It is claimed to have been the home of Hugh Herd, the giant of Kentmere, who went under the curious title of ‘the Cork Lad’. 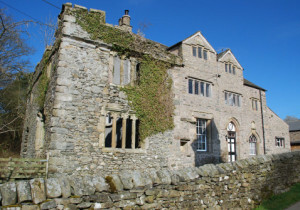 He was a champion wrestler during the reign of Edward VI and is credited with putting into place Kentmere Hall’s thirty-foot long chimney beam single-handedly. Apparently he was the scourge of the Scots and was thought to be able to pull up trees by the roots – this last claim possibly a slight exaggeration! But not content with one famous resident, Kentmere can boast two. Richard Gilpin, the man who reputedly slew the last wild boar in England, lived here also. Which is my favourite Westmorland pele tower? It’s an impossible dilemma. Burneside is exquisite, while Kentmere has wonderful associations. 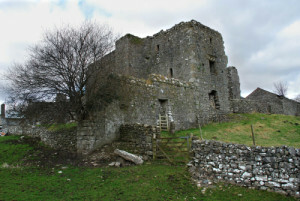 Lammerside Castle, a pele tower in the remote Mallerstang valley, is ruinous beyond belief, the upper storeys having collapsed and crushed the lower levels, with the whole thing now covered in grass and trees. At Clifton Hall you can look up through beams and rafters and spot substantial fireplaces, remnants of a vanished age. Killington Hall is a dilapidated ivy-clad pele tower set in a quiet hamlet with the remains of a medieval moat surrounding it on three sides. All have charm and interest aplenty. Eden will run where Eden ran. The evocative ruin of Pendragon Castle, set in the enchanting landscape of Westmorland, only serves to remind us that pele towers, so often overlooked and neglected, are a treasure trove of history, interest and charm. In our serene northern hill country, they remind us of turbulent times we can scarcely imagine – and how we should be thankful for the peace we now enjoy. A version of this article has appeared in Lancashire Magazine.